a. The Zimbabwean dollar is no longer in active use after it was officially suspended by the government due to hyperinflation. The United States dollar (US$), South African rand (R), Botswana pula (P), Pound sterling (£) and Euro (€) are now used instead. The United States dollar has been adopted as the official currency for all government transactions. The Republic of Zimbabwe is a country in the southern part of the continent of Africa. Its capital city is Harare. President Robert Mugabe is the leader of the country. Is one of the most poor countries and the HID in 2010 was the worst in the world. Zimbabwe is surrounded by other countries, and so it has no coast on the sea. This type of country is called landlocked. The countries that surround Zimbabwe are Zambia, Botswana, South Africa and Mozambique. The country is mostly savanna. In the east it is moist and mountainous with tropical evergreen and hardwood forests. Trees include teak and mahogany, knobthorn, msasa and baobab. Among the many flowers and shrubs are hibiscus, spider lily, leonotus, cassia, tree wisteria and dombeya. There are around 350 species of mammals in Zimbabwe. There are also many snakes and lizards, over 500 bird species, and 131 fish species. The area that is now Zimbabwe was added to the British Empire around 1890. 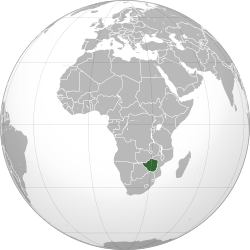 Zimbabwe is also known by its old name of Rhodesia. In 1965, it became an independent country when Prime Minister Ian Smith announced the Unilateral Declaration of Independence. The government was mostly controlled by the white population, similar to South Africa at the time. African citizens were given full equality in 1980, and the country's name was officially changed to Zimbabwe. Since then, Robert Mugabe has lead the country. Though Mugabe was elected fairly at first, he has since become a dictator, and has put in place a number of cruel and disastrous laws. The country Zimbabwe has a mixture of languages; Shona, Ndebele, Venda, Manyika, Nyanja, Chagani, and a unique-unified Zimbabwean English. Zimbabwe uses the currencies of several other countries. The government uses the United States dollar. The economy is currently in a bad situation. Foreign currency reserves are at very low levels, and the Zimbabwean Dollar has become very devalued. Just recently, three zeroes were taken off the Zimbabwean dollar (for example, $1,000,000 (one million dollars) would become $1000 (one thousand dollars)). Many observers link this to Mugabe's controversial Land Reform programme. Agriculture: Most people in Zimbabwe work in the field of agriculture: cattle, poultry, pigs, vegetables, millet, sorghum, maize, rice, cassava, tea, coffee, groundnuts, cotton, wheat, sugar cane, timber. Mining: Copper, silver, tin, coal, nickel, cobalt, gold, iron ore, asbestos, chrome. Manufacturing: Iron, steel, food processing, textiles, brewing, wood, furniture, tobacco. 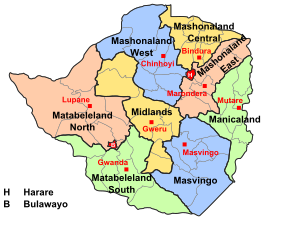 Zimbabwe is divided into 8 provinces and 2 cities that are the same as a province. Football is the most popular sport in Zimbabwe. Rugby union and cricket are also popular. Zimbabwe has won eight Olympic medals. Zimbabwe has also done well in the Commonwealth Games and All-Africa Games. Kirsty Coventry won 11 gold medals in swimming. Zimbabwe has also been at Wimbledon and the Davis Cup in tennis. Zimbabwe has also done well in golf. Other sports played in Zimbabwe are basketball, volleyball, netball, and water polo, as well as squash, motorsport, martial arts, chess, cycling, polocrosse, kayaking and horse racing. Most of these sports don't have international representatives but instead stay at a junior or national level. ↑ Zimbabwe. The Beaver County Times. 13 September 1981. http://news.google.com/newspapers?id=AFwtAAAAIBAJ&sjid=ydkFAAAAIBAJ&pg=3340,2548451&dq=zimbabwe+unity-freedom-work&hl=en. Retrieved 2 November 2011. ↑ CIA (2011). The World Factbook – Zimbabwe. 2011. Central Intelligence Agency. https://www.cia.gov/library/publications/the-world-factbook/geos/zi.html. Retrieved 2 November 2011. ↑ "Population 2012 Country Ranks". Countries of the World. http://www.photius.com/rankings/population/population_2012_0.html. Retrieved 15 October 2012. ↑ 5.0 5.1 5.2 5.3 "Zimbabwe". International Monetary Fund. http://www.imf.org/external/pubs/ft/weo/2012/01/weodata/weorept.aspx?pr.x=46&pr.y=0&sy=2009&ey=2012&scsm=1&ssd=1&sort=country&ds=.&br=1&c=698&s=NGDPD%2CNGDPDPC%2CPPPGDP%2CPPPPC%2CLP&grp=0&a=. Retrieved 24 April 2012. ↑ "Human Development report". UNDP. http://hdrstats.undp.org/en/indicators/161.html. Retrieved 15 April 2010. ↑ "Human Development Report 2013". United Nations Publications. 14 March 2013. http://hdr.undp.org/en/media/HDR2013_EN_Summary.pdf. Retrieved 18 May 2013. ↑ "Zimbabwe Currency". Wwp.greenwichmeantime.com. http://wwp.greenwichmeantime.com/time-zone/africa/zimbabwe/currency/. Retrieved 21 August 2011. ↑ "2004 Olympic Games swimming results". CNN. http://sportsillustrated.cnn.com/olympics/2004/schedules/117BySport.html. Retrieved 22 July 2007. ↑ "Montreal 2005 Results". Archived from the original on 28 January 2007. http://web.archive.org/web/20070128064425/http://www.fina.org/events/WC/Montreal_2005/results/sw.php. Retrieved 9 June 2007. ↑ "12th FINA World Championships". Archived from the original on 6 June 2007. http://web.archive.org/web/20070606111744/http://www.fina.org/events/WC/Melbourne_2007/results/swimming.php. Retrieved 9 June 2007. ↑ "BBC Sport Commonwealth Games 2002 Statistics". BBC News. http://news.bbc.co.uk/sport3/commonwealthgames2002/bsp/statistics/results.stm. Retrieved 29 August 2007. This page was last changed on 28 July 2014, at 17:04.